As a hood cleaning school, we have trained, qualified and certified hood cleaners across the USA and Canada that we can refer to you. Don't gamble with your restaurant, use ONLY certified hood cleaners. 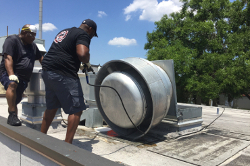 Our certified technicians will clean to NFPA Code 96 standards and provide you with; before and after pictures, greasing of fan bearings & belt changing, changing of grease pan to catch the grease from the fan on the roof, and clean the make-up filters on the roof to give you better circulation in the kitchen! Fill this form out below and we will provide you with a FREE inspection and price quote for your restaurant! EXHAUST HOOD SYSTEM CLEANING We offer exhaust hood cleaning service by trained, qualified and certified technicians that clean as per NFPA Code 96. We clean the entire exhaust hood system from top to bottom; lubing the motor and fan bearings with every cleaning, changing belt as needed, change roof grease pad so grease doesn't end up on your roof, clean the make up air filters for better kitchen circulation and give you before and after pictures with every cleaning and a very competitive price! HOOD FILTER WEEKLY CLEANING We offer weekly filter cleaning to restaurants so you never have to touch filters again. Once a week, we will come and take your dirty filters and swap them with clean ones. We order a brand new set of filters for your exhaust hood system...they are yours to keep with this service. We have very competitive pricing. 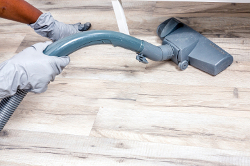 DEEP CLEANING OF RESTAURANT This service is offered on a bi-weekly or monthly basis. This includes vacuuming, mopping floors, dusting, bathrooms, windows, tables, chairs, bar, counters, foyer, glass, mirrors, lighting...Everything but the kitchen equipment. 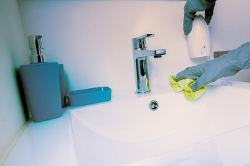 BATHROOM CLEANING This service is offered on a daily basis and includes the men's and woman's bathrooms.